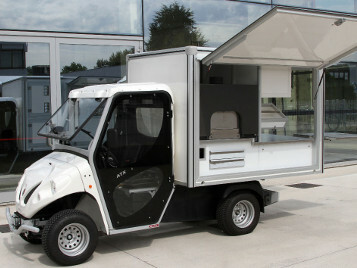 Alke has a wide choice of equipment for street food vehicles. Tailor-made solutions can also be created to meet the customer's specific street selling needs. For the street food sector, electric vehicles offer a multitude of advantages: access to historical town centres, extremely low running costs, no noise or exhaust emissions. All these factors make them the ideal choice for street sellers. Alkè has a wide choice of equipment for street food vehicles (for the sale of pizzas, sandwiches and ice-creams, with cooler box and closed isothermal box). Tailor-made solutions can also be created to meet the customer's specific needs. 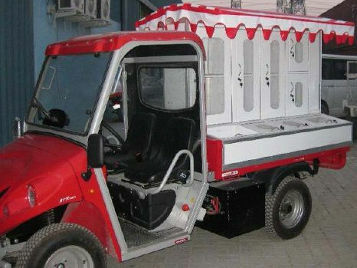 Some examples of the special Alkè electric vehicles for street sellers are shown below. 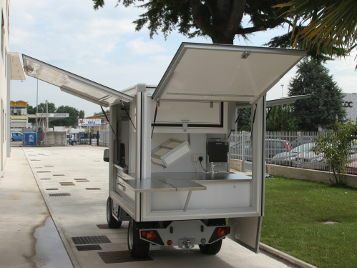 The Alkè vehicle equipped for pizza sales is a real mobile pizzeria. The cargo bed is fitted with an oven, two-basin sink with hot or cold water, a fridge, a work table, chilled containers for the ingredients, and a table for cutting and serving the pizza. The Alkè ice-cream van is ideal for street sales of ice-cream and soft drinks, as its isothermal box is divided into two separate compartments. There are two versions - with 3 tubs (6 flavours) or 6 (12 flavours). 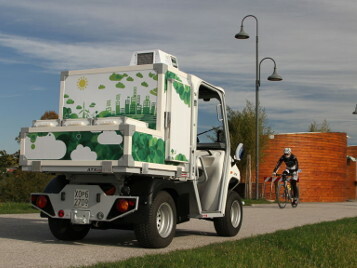 A special, fully electric vehicle for the sale of sandwiches and soft drinks. 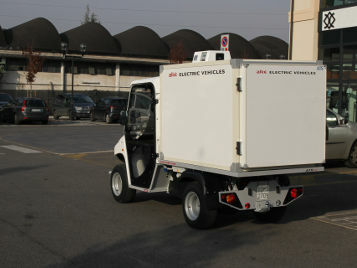 With 100% electric drive, it can even be used in closed places. 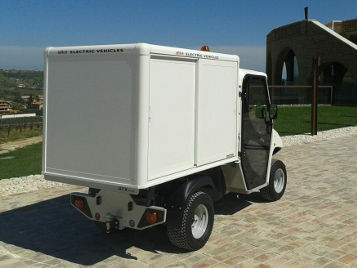 Alkè vehicles can move easily even on sand and, despite their compact size, the loading area contains everything needed for a real mobile sandwich bar. A refrigerated van type-approved for roadway driving, with ATP-FRAX certification, ideal for transporting perishable foodstuffs or other goods that need to remain in a chilled environment. Electric van with a thermally insulated loading bed to minimise heat loss and maintain the temperature of foodstuffs, which can be safely transported without jeopardising their quality. A real mobile café. A street bar equipped with everything necessary for your work.